The BIC Round Stic Xtra Life Ballpoint Pen is a dependable favorite that offers performance and value. This pen writes 90% longer on average than Papermate InkJoy 100 Ball Stick Pen. ** It features a versatile 1.0mm medium point that creates vivid lines, making it ideal for a variety of writing applications from note-taking to doodling. The pen comes with a reliable tungsten carbide ball point that spreads the ink smoothly and evenly. The flexible round barrel rests comfortably in your hand, while the translucent barrel shows the remaining ink supply, so you know when you're running low. 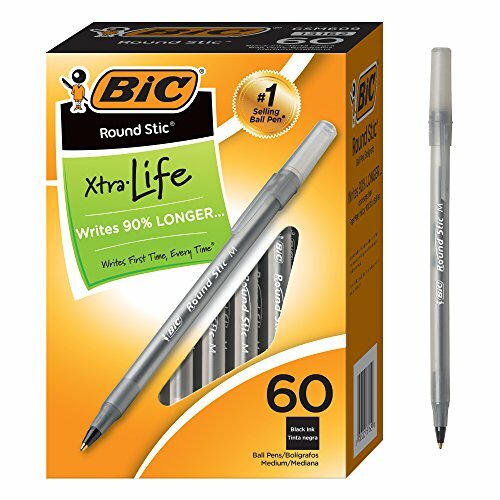 BIC Round Stic Xtra Life Ballpoint Pens are non-refillable. *Source: The NPD Group/ Retail Tracking Service/ U.S. Actual Unit Sales (Retail & Commercial Combined)/ Jul 2016-Jun 2017 ** Paper Mate and InkJoy are trademarks of Newell or an affiliate. Newell has not sponsored or approved and is not affiliated with this BIC branded product.